This Persistence Market Research report titled, “De-aromatic Solvents (<400 ppm aromatics) Market: EMEA Industry Analysis and Forecast, 2016-2024,” examines the EMEA de-aromatic solvents market for the forecast period 2016 - 2024. The primary objective of the report is to identify opportunities in the market and present updates and insights pertaining to various segments of the EMEA de-aromatic solvents market. The report begins with an overview of the EMEA de-aromatic solvents market , appraising market performance in terms of revenue and volume, followed by an in-depth analysis of key trends, drivers, and restraints witnessed in the EMEA market. Impact analysis of the key growth drivers and restraints based on the weighted average model is also included in the report to equip the client with pertinent decision-making insights. The report further analyzes the market based on flash point and presents the forecast in terms of value and volume for the next eight years. The subsequent section of the report includes analysis of the EMEA de-aromatic solvents market on the basis of application and forecast in terms of value and volume for the next eight years. The report further analyzes the market based on countries and presents the forecast for the next eight years. To understand and assess opportunities in this market, the report is categorically divided into three key sections on the basis of flash point, application, and region. The report analyses the EMEA de-aromatic solvents market in terms of value (US$ Mn) and volume (metric tons). In the final section of the report, the de-aromatic solvents market competitive landscape is included to provide a dashboard view of companies that manufacture and supply de-aromatic solvents. The report contains company profiles of some of the players operating in the EMEA de-aromatic solvents market. Some of the market participants identified in the EMEA de-aromatic solvents market include Exxon Mobil Corporation, Royal Dutch Shell plc., Total S.A., Neste, Idemitsu Kosan Co., Ltd. and DHC Solvent Chemie GmbH. To calculate the market size, the report considers various aspects based on secondary research. Furthermore, data points such as regional split and market split by application and qualitative inputs from primary respondents have been incorporated to arrive at appropriate market estimates. The forecast presented in the report assesses the revenue generated by the sales of de-aromatic solvents in the EMEA region. While developing the market forecast, the report begins by sizing the current market, which forms the basis for forecasting how the market is anticipated to take shape in the near future. Given the characteristics of the market, data is triangulated through analysis based on the supply side, demand side, and dynamics of the EMEA de-aromatic solvents market. However, quantifying the market across the above-mentioned segments and regions is more a matter of quantifying expectations and identifying opportunities rather than rationalizing them after the forecast has been completed. It is imperative to note that in an ever-fluctuating EMEA economy, we not only conduct forecasts in terms of CAGR but also analyze the market on the basis of key parameters such as Year-on-Year (Y-o-Y) growth, to understand the predictability of the market and to identify the right opportunities. Another key feature of this report is the analysis of the EMEA de-aromatic solvents market by region, flash point, and application, and the corresponding revenue forecast in terms of absolute dollar opportunity. This is traditionally overlooked while forecasting the market. However, absolute dollar opportunity is critical in assessing the level of opportunity that a provider can look to achieve as well as to identify potential resources from a sales perspective of the EMEA de-aromatic solvents market. To understand key segments in terms of their growth and performance in the de-aromatic solvents market, Persistence Market Research has developed a market attractiveness index. The resulting index should help providers identify existing market opportunities in the EMEA de-aromatic solvents market. Rules and regulations pertaining to the exposure of chemicals are very stringent particularly in Europe. Necessary precautions are therefore taken in case of factory workers who come directly in contact with the various solvents. De-aromatic solvents have high exposure levels and are used in various factories as their usage is safer for the workers. De-aromatic solvents, also called de-aromatized hydrocarbon solvents or de-aromatic solvents, are a class of hydrocarbon solvents that are characterized by the presence of paraffinic, iso-paraffinic, and naphthenic components with very low aromatic content (<400 ppm). On the basis of flash points, de-aromatic solvents have been classified in to three product segments, namely low flash point, medium flash point, and high flash point products. These de-aromatized hydrocarbon solvents with extremely low aromatic content find application across a diverse set of industries including resins and paints, metal working fluids, cleaning and degreasing products, pest control products and other applications. Consumption of de-aromatic solvents market was pegged at around 380,000 tons in 2015. 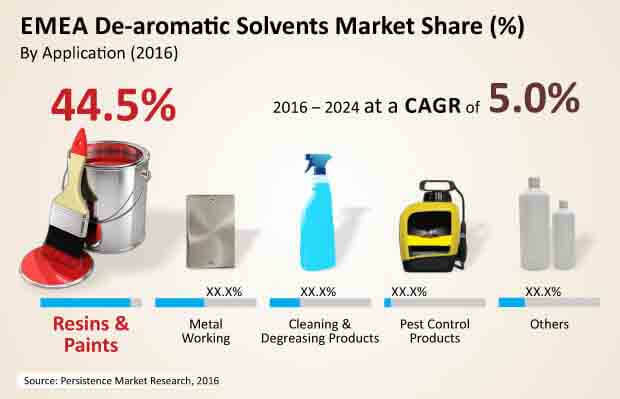 In terms of value, the EMEA de-aromatic solvents market is expected to register a CAGR of 5.0% over the forecast period (2016 – 2024), to reach US$ 556.0 Mn by 2024. Over the past few years, regulatory authorities and organizations especially in EMEA region have framed stringent policies that govern the production and use of solvents in order to curb the menace of hazardous Volatile Organic Compounds (VOCs) that are released into the atmosphere. Such regulations have encouraged the usage of alternatives such as de-aromatic solvents having relatively lower VOC content. Moreover, demand for de-aromatic solvents, particularly with higher flash points, is expected to witness steady growth in applications such as metal working that necessitates the use of solvents that are relatively less corrosive, less toxic and exhibit low odor. Furthermore, increasing demand for paints, resins and coatings especially from countries in Eastern Europe and Africa is expected to fuel the growth of the EMEA de-aromatic solvents market during the forecast period. However, demand for bio-based solvents is expected to witness steady growth in the region. This, coupled with increasing consumption of water based coatings and powder coatings as against solvent based coatings is expected to act as an impediment to the growth of the de-aromatic solvents market in the EMEA region during the forecast period. Key players in the EMEA de-aromatic solvents market offer solvents that are tailored as per client-specific end-use requirements. Persistence Market Research, in its report titled, “De-aromatic Solvents (<400 ppm aromatics) Market: EMEA Industry Analysis and Forecast, 2016-2024,” has segmented the EMEA de-aromatic solvents market by flash point, application, and region. On the basis of flash points, the EMEA de-aromatic solvents market has been segmented into the low flash point (<500C), medium flash point (500C - 800C), and high flash point (>800C) segments. On the basis of application, the market is segmented into resins & paints, metal working, cleaning & degreasing products, pest control products and others. Others segment includes use of such solvents in applications including drilling fluids, chemical intermediates and crop protection, among others. Various factors are expected to moderately impact demand for de-aromatic solvents. Consumption is expected to reach 510,954 Tons by 2024. The drivers are expected to result in a relatively low impact on demand for de-aromatic solvents during the forecast period, wherein the CAGR is to be 2.9% in terms of volume. Consumption is expected to reach 486,752 Tons by 2024. Germany, Italy, France and U.K, collectively are estimated to account for nearly half of the overall EMEA de-aromatic solvents market value in 2016. Consumption of de-aromatic solvents in North African countries is expected to register relatively faster growth during the forecast period. On the other hand, mature markets namely Germany, France and U.K. are expected to register relatively slower growth during the forecast period, partly due to growing adoption and use of alternatives such as bio-based solvents and that of water based alternatives for certain applications. Some of the key players identified in the EMEA de-aromatic solvents market include Idemitsu Kosan Co., Ltd., Exxon Mobil Corporation, DHC Solvent Chemie GmbH., Royal Dutch Shell plc., and Total S.A., Neste.